Having my very first poutine in Montréal! Montréal and food. I had no idea this combination would be so potent. After four days in Montréal and several pounds heavier (I’m guessing! ), I was convinced… this awesome Canadian city is a foodie’s dream! 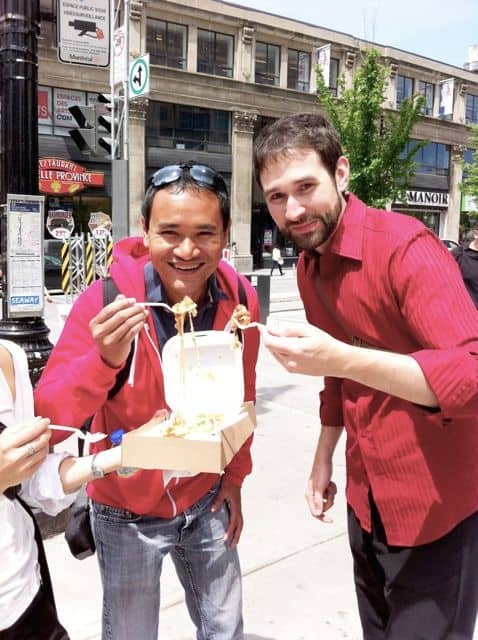 A great way to get yourself acquainted with the diversity of Montréal’s foodie scene is to join the Flavours of the Main walking food tour. It was one of the highlights of my stay in Montréal. 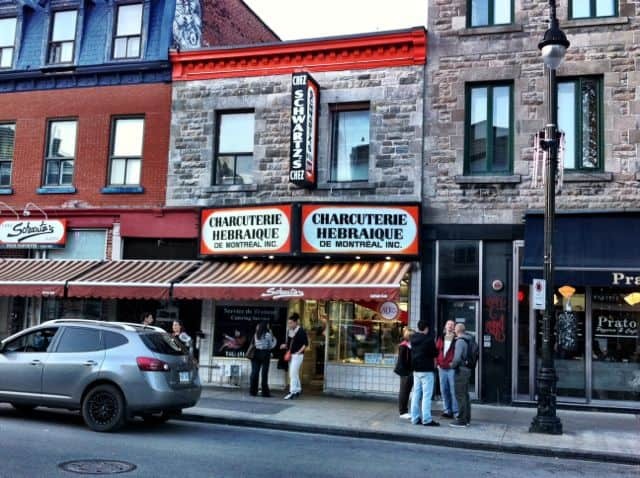 This food tour, organised by Fitz & Follwell, kicks off in Chinatown and continues along Boulevard St. Laurent. Our lovely guide, Leah, greeted us with a big smile before taking us to our first stop: Wing Noodles. Wing Noodles is somewhat of an institution in Montréal, producing all sorts of noodles (fresh and dried), dumpling wrappers and fortune cookies! Whilst there, we learned about the fascinating history of the Wing family and the origins of their business. We then continued to another Montréal institution: Mr. Chin’s Dragon Beard Candy. Mr. Chin wasn’t there that day but his wife gave us a fantastic demonstration of how dragon beard candy is made. The candy itself is a dream for anyone with a sweet tooth! Our lovely guide Leah introduces us to dragon beard candy! Our next stop was the perfect way to wash down those sugars: a tea-tasting at My Cup of Tea! This tea shop stores a wide variety of Chinese teas and our host described the character and health benefits of each tea with great passion. The fabulous tea-tasting at My Cup of Tea in Chinatown. After a very insightful tea-tasting, it was time for more food! Leah guided us to a Banh Mi Cao Thang, a Vietnamese eatery, where we ordered some delicious Vienamese pork baguettes. It was a delight to experience and chat with the local Asian population, and share their enthusiasm for food! Leah was terrific as a guide – I love it when tour guides really know the people and their stories, and can share all sorts of anecdotes and little insights with their visitors. We continued our tour along Boulevard St. Laurent and soon left the Chinatown district. It was time, I guess, for something more substantial. Waiting for us was Quebéc’s most famous dish: poutine! So what’s poutine, you might ask? In its basic form, it’s french fries topped with gravy and cheese curds. There are also versions which contain bacon, beef, poultry or seafood. We had the classic version. 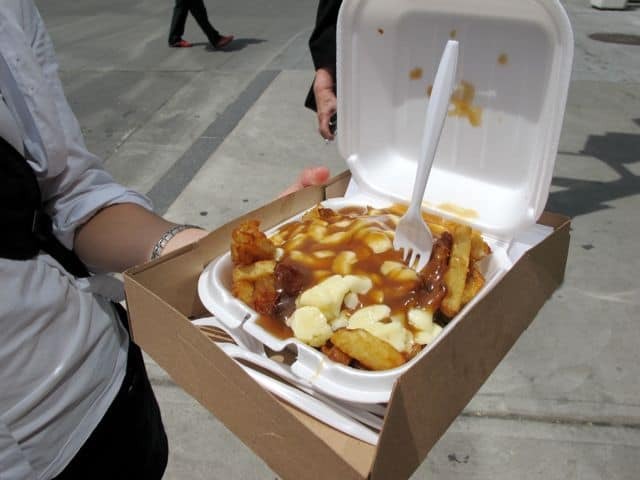 Montréalers swear that poutine is the perfect cure for hangovers! It looked horrific but that first, tentative bite was unforgettable. French fries, crisp on the outside, drenched in a rich gravy and buried under melted cheese curd – it was stunning!! I dug in for more! Leah was visibly amused by us first-timers! We followed Leah as she led us further up Boulevard St. Laurent. Along the way, it’s impossible not to notice the influence of the many immigrants (Chinese, Vietnamese, Jews, Portuguese, Lebanese, Greeks, Italians, Spaniards and the list goes on) who have made Montréal their home. Many of them have been here for generations. 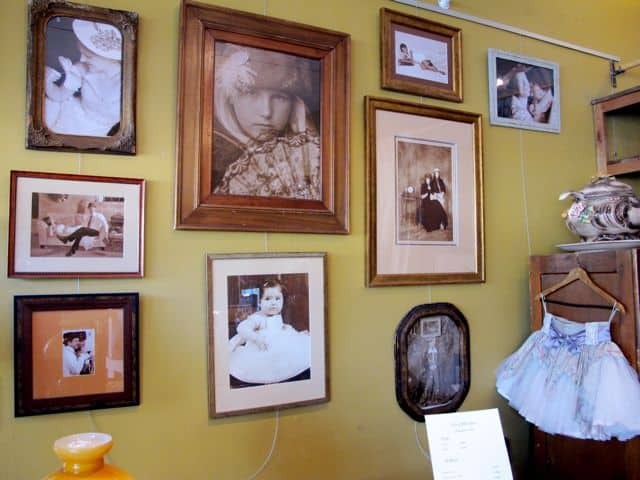 I couldn’t help but wonder about their stories; the family photos that hang in their stores only served to pique my curiosity even more. Our next stop was a truly unique place: La Librairie Espagnole. Owned by a Spanish family for generations, the Librairie is a food deli that also sells all sorts of Spanish products, books and shoes! We were welcomed with open arms and big smiles, and soon after, we were treated to a gorgeous platter of murcia cheese with quince paste (membrillo). I’m a big fan of Spanish cuisine so this store was a little paradise for me. The many cheeses, cured meats and sausages sent my senses into overdrive! I loved this store! By this time, we were wondering how we were going to continue – my stomach was starting to protest! Leah had different ideas. She showed us our next stop: the Charcuterie Hongroise. 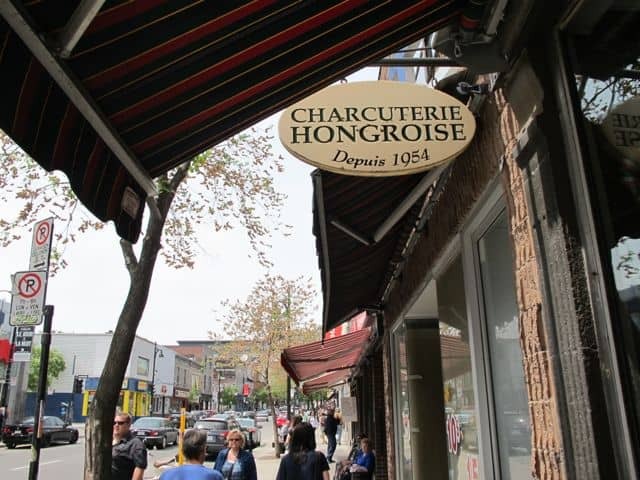 Opened by a Hungarian immigrant family in 1954, this store is another institution in Montréal. They specialise in home-made sausages and deli meats. I noticed their sausage and sauerkraut sandwiches and I sighed! They looked and smelled divine! I decided to try the spicy sausage anyway, without the bread and sauerkraut. Gosh, it was amazing! We chatted with the owner, who was quite a character, and had a good laugh with him. We stumbled out of the Charcuterie in a great mood but with visibly bulging tummies! Leah cheered us on to our final stop, arguably the most famous deli in Montréal: Schwartz’s. 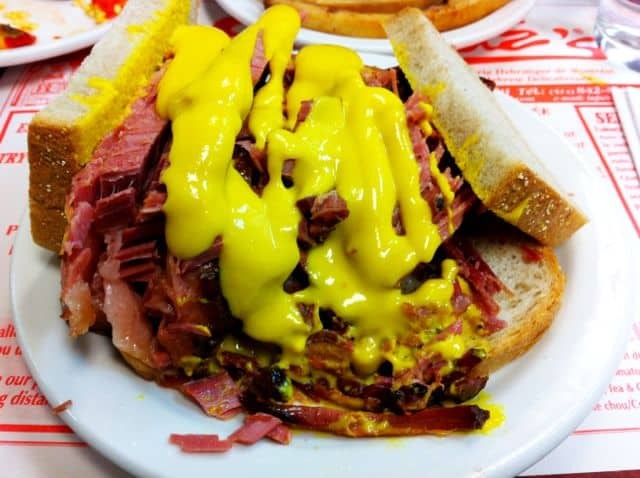 There’s one thing you absolutely have to try here: the smoked meat sandwich. Imagine the look on my face when I laid my eyes on the sandwich! The meat was beautifully tender and the mustard topping was perfect, but I was done after two bites. I saved the rest for later. The tour was terrific, thanks to Leah’s knowledge about the city, its history and the many little stories. It was clear that this was much more than just a food tour – along the way, we caught glimpses of the soul of the city through the eyes of its multi-ethnic citizens. I truly enjoyed it and will recommend this tour to anyone visiting Montréal. Don’t forget to go on an empty stomach! In the following days, inspired by this tour, I explored the various neighbourhoods of this wondrous city and looked out for more foodie treats, and I found many, many more! One little discovery I particularly enjoyed was the Porchetta kiosk at the Promenade du Vieux-Port. The porchetta sandwich was sublime! There were also many other foodie delights at the Marché Jean Talon (Jean Talon Market). If you’re looking for a fabulous restaurant, you have to check out Joe Beef! Try the scallops and/or the succulent steaks. Like me, you’ll soon discover that food and Montréal are a match made in heaven! Bon Appétit! Note: I was hosted in Montréal by the Canadian Tourism Commission, Tourism Montréal and HouseTrip. All opinions expressed above are mine. Didn’t even know this existed. Gotta try it out! oh my word the smoked meat sandwich looks amazing, would definately want to try that! plus being a tea addict, would love checking into My Cup Of Tea! truly montreal has tonnes to offer1 incredible article! cheers! Haha, glad the article had that effect on you Frank! 😉 And, yes, Leah was a fantastic guide! Keith, you just made me home sick (and a little bit hungry) with this article. Montreal is a truly special place. Glad you’ve enjoyed it. And it seems that you can not praise enough your guide Leah. She certainly knows her way around. Awesome! Montréal is one of my favourite cities in the world – went there for the first time last summer and just fell in love with it. Have a great time and check out the food tour. It really is very cool!